Buses - you are very welcome to use the coffeeshop for bus discussions and qns. Great Western Coffee Shop > All across the Great Western territory > Buses and other ways to travel > Buses - you are very welcome to use the coffeeshop for bus discussions and qns. 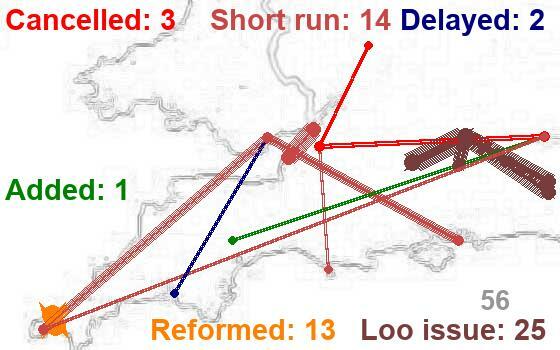 Around 15% of TransWilts journeys during our three day survey involved connecting to of from a bus - and considering that one of the three survey days was a Sunday when buses are as rare as pink elephants in these parts, is probably a low estimate. And buses are a natural, linking part of the journey. Bus route 234, after 10 p.m. at night, accepts rail tickets between Chippenham and Trowbridge giving an extra late service into Melksham from each direction, and also through from Chippenham to Trowbridge. However, this has appeared only in a footnote in timetables thus far (but the CRP's line timetable from last Sunday now includes it in the main table). 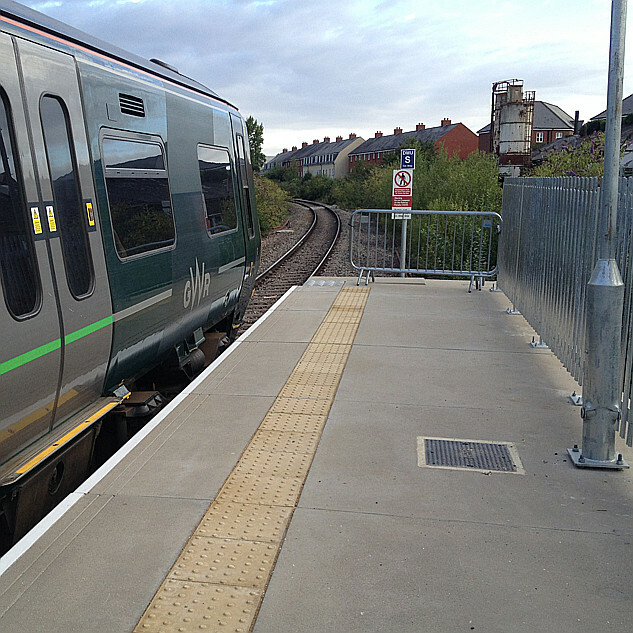 There's also a connecting bus in Melksham - the Melksham Rail Link bus - bringing commuters to the station for the morning departures to Swindon, and taking them back home off the peak trains in the evening. Again, that's featured prominently in the line timetable. Looking wider, this pattern of bus use is probably repeated all over the area to the west of London, the South West and South Wales. And from reading reports here on the forum, bus users have many similar issues to train users. So it would seem logical for us to support bus posts here, and last night I changed "Other ways to travel" into "Buses and other ways to travel" as a pointer to say "Bus posts not only welcome, but actively encouraged". Same guildlines as rail posts. Members welcome to sign up just to talk about buses. Talk about any bus company you like, or proposals - but please keep it towards posts that relate to our quadrant of the country. Moderators will (I'm sure) be generous in that definition. Re: Buses - you are very welcome to use the coffeeshop for bus discussions and qns. Stagecoach will be making further headroads into the Bristol Area from September 3rd. First Buses route 79, Bristol Bus Station to Thornbury via a circuitous route including Southmead Hospital and Bristol Parkway Railway Station is being withdrawn by First and the route is being taken over by Stagecoach operating from their Stroud Depot. The service route number will still be the 79 but it will also follow a circuitous route in Thornbury to cover the Thornbury Local services which are currently operated by Severnside Transport which seem to be withdrawing from providing timetabled bus services. Interesting. How much of that is First "pulling out", and how much is First moving to provide something different from South Gloucstershire into Bristol - i.e. Metrobus, with the odd gaps that are left as a result offering opportunities to the like of Stagecoach? Sorry but I got my route number mixed up, my post should have read the route 77 and operates from Lewins Mead, a three minute walk from the bus station. Grahame, I don't know how much you know about MetroBus apart from what is posted on this Coffee Shop forum. I don't, living in the Bristol Area, claim to be an expert on this subject but from my own observations the preparations for it have been nothing less than a mitigated disaster for the areas of Bristol where work has been taking place in preparations for it which has had its inevitable knock-on effect on those central areas not directly affected by the work by causing traffic gridlock almost daily since work commenced. Take personal experiences of mine. On a bus travelling into Bristol Bus Station running 45 minutes late pulls up at a bus stop, a second bus pulled up behind running only 15 minutes late. Driver of that bus, whom I knew to be an inspector grade jumps out of his bus and boards the bus I was on and instructs all passengers to board his bus behind, tells driver of bus I was on to return to the Bus Station direct via quickest route not even allowing passengers travelling to the Cabot Circus / Broadmead Shopping Areas and Bristol Bus station itself to stay on the bus and travel direct and non-stop to the Bus Station. Waited ages for a bus on the Centre towards the Bus Station when one turned up I could use. Displayed destination of bus was Southmead Hospital, I boarded and placed my Diamond Travelcard on the ticket machine, as it beeped the buses radio crackled into action and asked driver where he was, he replied and was instructed to terminate the service there and then and return to Ashton Vale in service and then come to the depot as there was no relief for him at Nelson Street as his relief had been delayed earlier in the day and was now out of hours. Waiting for a bus at my local towns bus station for a 10 minute journey home a service from Bristol arrives which uses the M32 to Hambrook. Driver turfs passengers off and instructed to board bus which pulled up in adjacent bay unless passengers were travelling to Chipping Sodbury Church or the Boot as SHE was going directly to Sodbury to try and pick up a bit of lost time. This is a regular occurence evenings. As part of this MetroBus project it has entailed the extension of the inbound M32 bus lane back to the M32 railway overbridge, this has been completed as far as I can see, all lighting columns are bolted down to the concrete wall which has replaced the central reservation. Similarly are the CCTV Bus Lane cameras and the Bus Lane pictorial signs, the one showing a bus and a motor cyclist are all in place yet the extended bus lane remains coned off to the point where the original bus lane commenced. Why not open it up to bus traffic now and not wait until MetroBus starts running as it wont be for at least a year before it starts running to Cribbs Causeway on its projected route as there is a little problem called the new Gypsy Patch Lane railway overbridge to be constructed which will provide a 4 lane, 2 normal traffic, 2 bus lanes, box section bridge under the main London - South Wales rail line just south of Patchway Station replacing the narrow low bridge there at present. Plans of this bridge were available to view on South Gloucestershire Councils website, that's where I saw them. As for another part of the Bristol Northern Fringe area covered by this project, Emersons Green, this is currently scuppered by the closure of the Bromley Heath Road Viaduct in the east to west direction and destined to be a year long repair job due to the lack of preventative maintenance by successive responsible LA's, South Gloucestershire and before them Avon, but now reduced to 8 - 9 months due to the generosity of the new Metro Mayor in handing over part of his millions of promised dosh if the former Avon area opted to elect a Metro Mayor of which only 3 of the 4 Unitary Authorities opted for and thus hopefully reduce the timescale of the works by 3 - 4 months. Another foul-up on this project was the contruction of a bus shelter on the part of Emersons Green Way from the exit to the Emersons Green Retail Park to the Roundabout on the A4074 Ring Road. The past few occasions I have passed this new bus stop I have noted it is being re-worked and a concrete wall is being built behind where the bus shelter would be positioned. Asking the question, why?, I was told that there were fears that if the embankment slipped during or after heavy rain waiting passengers would be trapped and crushed by a destroyed bus shelter and the mass of soil that would be washed down in the embankment slip. If you saw this embankment you'd say it was well over the top, its nothing like like scale of the cliffs along line rail line at Dawlish but the work being done now would suggest it to be so..
As I stated at the beginning of this post I am no expert but I understand that the original intention was that the LA's involved would provide the infrastructure and invite bus operators to bid for the opportunity to run the services specified by the LA's AND PAY for the privilege. The LA's had no takers and have had to resort to offering subsidies to operate the routes of which First Bus has, to my knowledge, been the only operator to express an interest so far. I probably know more than I admit. And far less than I would need to pass off any thoughts as more than personal thoughts, flavoured with experiences from using the services and systems a few times. I have personally found the area to the north of Bristol / south of Gloucestershire frustrating to travel around, both with and without a car. For sure, it can be passed through on the M4 / M5 relatively quickly and cleanly, but visiting within the area or moving around it has seemed incredibly slow. So it should be good news that something's being done to make it better, and accepted that there may be interim pain as changes are made to let that something in. Logic suggests we are currently at a low point, having seen a lot of the pain of that work with no gain on actual journeys as yet. The 77 and (?) 73 both run around the Bradley Stoke area, taking an age to cover a few miles as the crow flies, on long joined up route segments through streets that are prone to long traffic jams / queues. Never going to be easy to keep them on time without a lot of resource added for robustness, or by splitting the routes and failing to connect if something goes wrong on one segment. Frustrating ... but the suggested solution is what? I would love to see / have seen some sort of fast (railed?) crowd / queue buster stuff serving the area. What that should be / have been, I don't know enough to do more than guess at an answer through a smokescreen of publicity from various interested parties with different views. Funny how just three upper-case letters can change the way one reads a long, carefully-written post. Is there something remarkable - or even annoying - about a person who appears to gender-identify as female driving a bus? Or was it just a typo, and silly old me for making a fuss about nothing? I took that what was said was "I am going straight to Cows Lip Meadow" or wherever it was and moved in the third person it had to be he or she.. Would have been hard to find a gender neutral words, an using he would have been incorrect if indeed the driver was a woman. So I read no gender bias in there ... hopefully martyjon can confirm that?